Gerald Celente: Founder & Director of the Trends Research Institute – Gerald has had a long track record of making some of the most controversial, yet correct calls in terms of global trends and events. 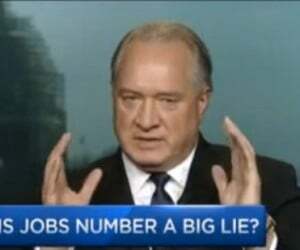 In fact, many consider Mr. Celente to be the top trends forecaster in the world. 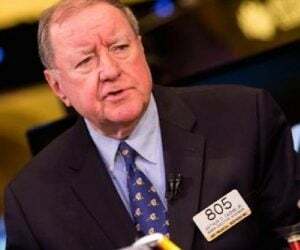 Gerald has been quoted and interviewed in media throughout the world such as KWN, CNBC, Fox, CBS, ABC, NBC, BBC, Time Magazine, The NY Times, The Wall Street Journal, Business Week, FT, U.S. News, World Report, The Economist, L.A. Times, Chicago Tribune, Washington Post and more. ***To subscribe to the Trends Journal for less than 29 cents a day CLICK HERE. 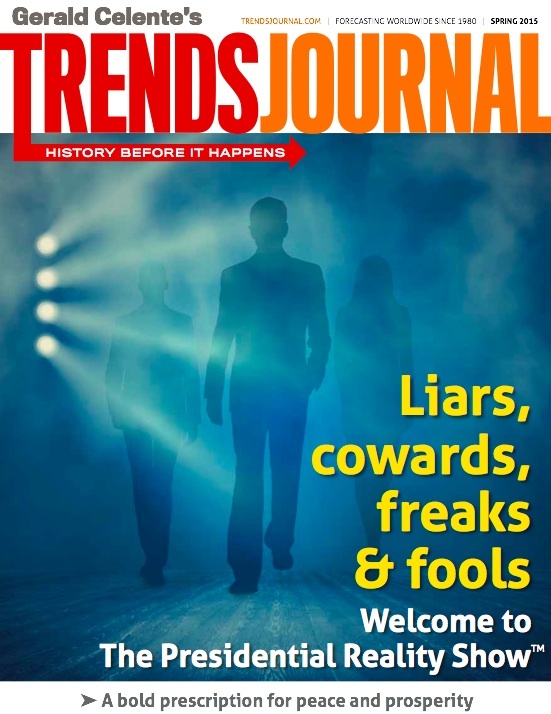 The Trends Journal® is the world’s number one source for information about the most important trends shaping the future. Four times a year, we show you how these trends will affect your life, how to profit from them, and how to avoid strategic pitfalls. Regardless of your business or profession, the Trends Journal® provides insights, strategies and opportunities to help you navigate these treacherous, unprecedented times. Gerald Celente, who developed the Globalnomic® methodology to identify, track, forecast and manage trends, is a political atheist. Unencumbered by political dogma, rigid ideology or conventional wisdom, Celente, whose motto is “think for yourself,” observes and analyzes the current events forming future trends for what they are — not for the way he wants them to be. And while Celente holds a U.S. passport, he considers himself a citizen of the world. Learn more about Gerald’s background, experience and skills. Gerald Celente, a pioneer trend strategist, founded the Trends Research Institute in 1980. He is the author of the national bestseller Trends 2000 and Trend Tracking: Far Better than Megatrends (Warner Books), and publisher of the internationally distributed quarterly Trends Journal. 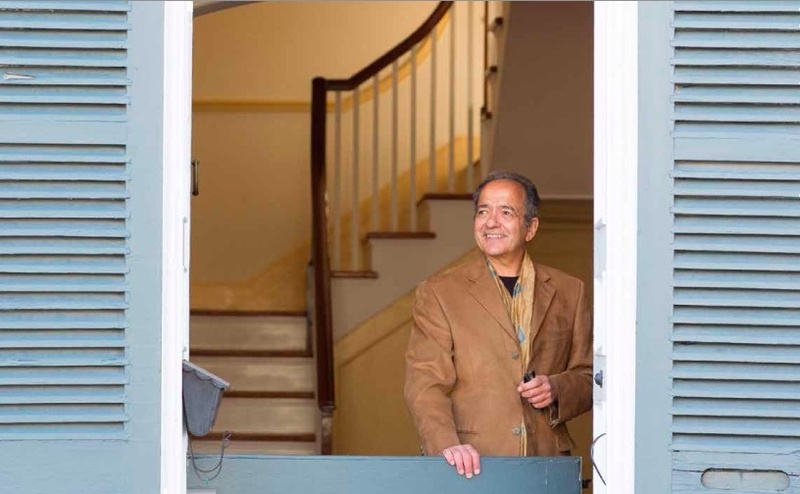 For more than three decades, Celente has built his reputation as a fearless teller of the truth, an accurate forecaster and an analyst whose expertise crosses many arenas, from economics to politics, from health to science, and more. Most important, Celente is a pure political atheist. Unencumbered by political dogma, rigid ideology or conventional wisdom, Celente—whose motto is “think for yourself”—observes and analyzes the current events forming future trends, seeing them for what they are – not as what he’d like them to be. As with a doctor who gives his diagnosis after gathering the facts, whether or not you like the prognosis doesn’t alter the outcome, it’s simply what is. And while Celente holds a US passport, he considers himself a citizen of the world. At the heart of Celente’s work – and his remarkable durability as an innovative, accurate forecaster – is his unique perspectives on current events forming future trends. He developed the Globalnomic® methodology to identify, track, forecast and manage trends.To this day, this methodology stands by itself for its accuracy, vision and penetrating insights into the trends taking shape across the globe. Covering scores of diversified trends fields, Gerald Celente and the Trends Research Institute provide trend research studies and consulting services to individuals, professional organizations, businesses and governments worldwide. Celente also designed the nation’s first professional course in trend forecasting. Prior to founding the Institute, Celente was a Government Affairs Specialist and an Executive Assistant to the Secretary of the New York State Senate. 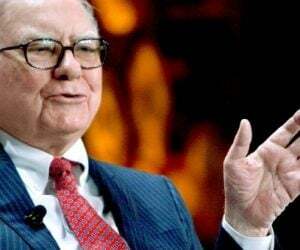 He earned an Honorary Doctorate Degree in Law from the National University of Health Sciences and a Masters in Public Administration from West Virginia University. In the final analysis, it’s about the quality, frequency and accuracy of the forecasts Celente has made. He earned his reputation as “The most trusted name in trends” by accurately forecasting hundreds of social, business, consumer, environmental, economic, political, entertainment, and technology trends. 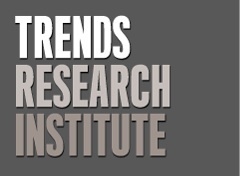 What is the Trends Research Institute? Celente, a top trends analyst featured in newspapers and on TV, was going through a painful divorce. 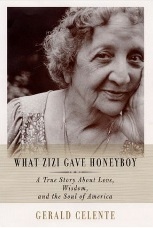 Zizi, his 80-year-old aunt, had just lost her husband. They had already been close, but now they were spending much more time together and forming a special bond. Zizi’s endearing, homespun wisdom has been all but lost. Working through painful phlebitis in her legs, she continues to serve up huge Italian meals for Gerald and impart her thoughts on the sorry state of affairs of fractured families, the displaced and abandoned elderly, and the corrupt government that says it cares but does little. Zizi’s wisdom is good medicine for Gerald and can help anyone through tough times.